This weekend was a very lemony weekend. On Saturday Rob and I picked 18 pounds of Meyer lemons off our very young tree. We hauled them inside in buckets, and pretty soon they were rolling around all over the counters. Since the lemons were looking a bit dingy, Rob scrubbed and polished them. When he was done, they literally glowed . . . and the kitchen smelled so lovely. Rob is very thorough with his lemon polishing. We spent some time admiring our clean, buffed lemons, and then we squeezed them for juice. We sat at the kitchen table squeezing lemons and talking about various dumb things. I had gone to St. George Island with my family over Christmas, so I was telling Rob about the trip. "Jake wore his pajama pants all day on Christmas," I said. (Jake's my nine-year-old nephew.) "But not his pajama shirt. No, he wore a nice polo shirt, along with football gloves, bright orange shoes, and a red satin tie that played music. His pajama pants had a superhero print, and they were rather short, like culottes." "Jake's got style," Rob said. "Bunny and I gave him some Domo magnets and he decorated his scooter with them right away. His scooter is looking awesome." "He didn't want to wear his helmet though, when he was riding around the island. He said he wanted to go bare-headed so people would be able to tell he was blond." "Kris told him not to worry since his helmet allows clear visibility of his bangs." Anyway, Rob and I squeezed a bunch of lemon juice and froze it. But we saved out a little to make lemonade. Here's our recipe. 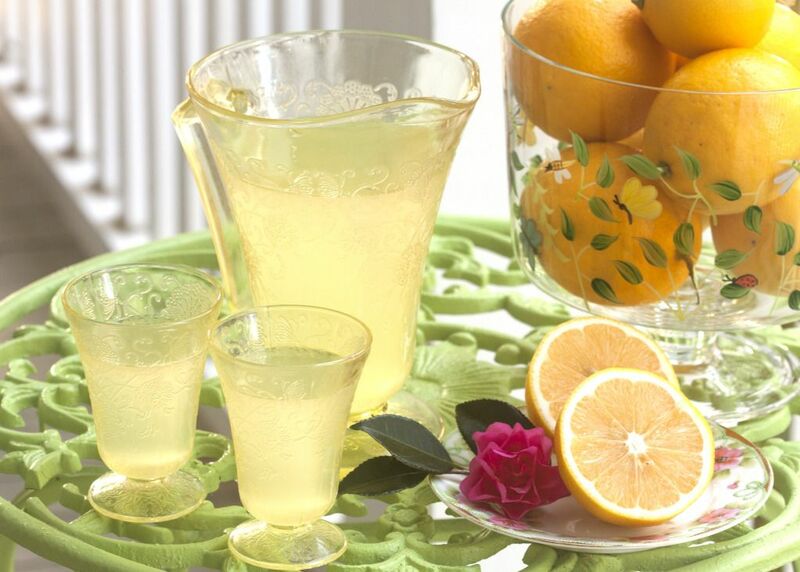 Fresh lemonade is so easy to make and it tastes delicious cold or hot. I like mine hot . . . and I like to drink it in my robe and slippers on a chilly winter night while holding three or four cats in my lap. Mom used to make me hot lemonade when I was little, so to me it's sort of a comforting, medicinal thing like chicken soup. Add lemon juice, sugar, and water to a large pitcher. Stir until the sugar dissolves. A Meyer lemon isn't a true lemon but rather a cross between a lemon and a mandarin orange. Don't you like how fat the Meyers are? And they're sweeter and tastier than regular grocery-store lemons. Your Meyers look great and that lemonade refreshing and tasty. Your photo of it all is really lovely. Very pretty photo. I have a 3' Meyer Lemon tree that is struggling like crazy. I have very little luck with any lemon or citrus tree here in central Florida and that's pretty sad. We had 2 lemons this year. :-( And I agree, the taste is far tastier and sweeter than what you find in the stores. Have a wonderful, healthy, happy new year! The lemonade looks wonderful! Happy New Year! Thank you so much, Lorraine. I hope you have a lovely New Year! Hi Eli, thanks! I don't know why our lemon is doing so well. It's planted on the north side of the house in clay! I do fertilize it three times a year with Citrustone, but that's really all I do. Satsumas do well here too, and so do kumquats. We can't really grow oranges very easily. . . .
Hi Randy, thanks for visiting! My sister has a Meyer lemon that she keeps in a pot and drags into the garage on cold nights. It still produces tons of lemons even though it's in a pot. I guess that's a pretty good way to go if you're worried about the cold. Thank you, Sweetbay. Happy New Year! That's a great picture of the lemonade! Thanks, Anonymous. Now I wish I'd added ice and lemon rings to the pitcher. I always have regrets about my pictures. Sharon, how do you make it? Meyer lemons are so much better than regular lemons, don't you think? Don't you just love picking lemons from your own tree?!! I didn't know what a Meyers lemon was. And, I love that photo at the bottom of the post. SOOOO pretty! !